People generally believe that "Shiva" is not mentioned in Vedas but "Shiva" is mentioned in the Śatarudrīya in the eighth anuvaka of the Sri Rudram of Yajurveda. That text is the origin of the Pranava Panchakshari Mantra "Om Namah Shivaya". Can anyone please provide that verse in Sanskrit with English translation? Sri Rudram is in Prapathaka 5 of the Fourth Kanda of the Taittiriya Samhita of the Yajur Veda. Sri Rudram is also in Adhyaya 16 of Vajasena Samhita of Shukla Yajur Veda. Vajasaneyi Samhita consists of 66 verses in Sri Rudram. 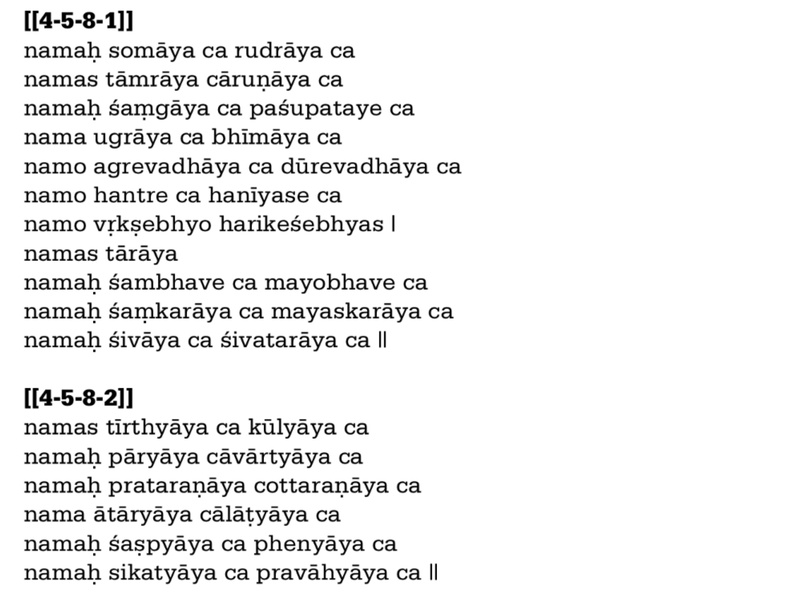 The second verse of 1st Anuvaka itself mentions the word Shiva. The third verse of the 1st Anuvaka also mentions the word Shiva. "Namah shivaya" is being translated here as "homage to the auspicious", since the word "shiva" literally means auspicious. Not the answer you're looking for? Browse other questions tagged vedas shiva mantras yajur-veda .